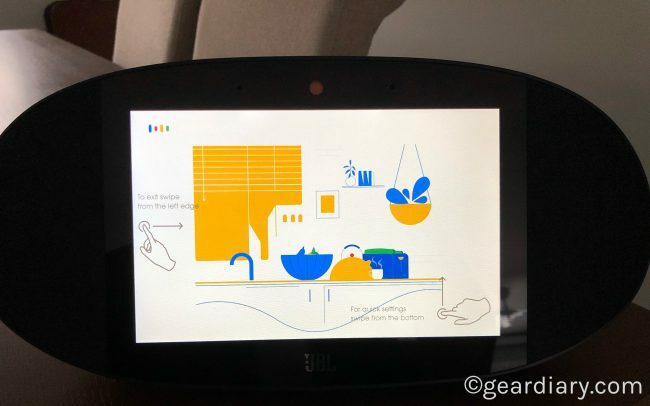 My home is filled with Amazon Echo devices but, as Judie and Carly reported, it was Google Assistant rather than Alexa that was on display at CES 2019. 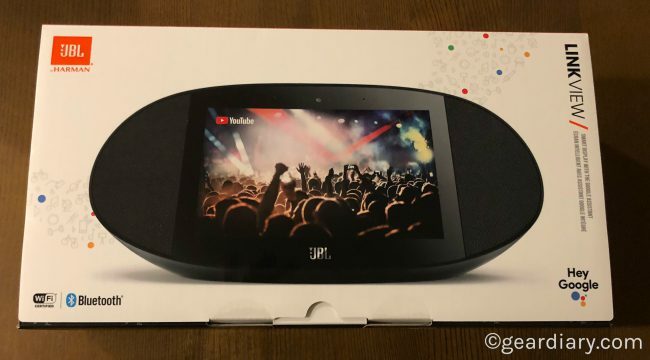 If the amazing JBL LINK VIEW I have been reviewing is any indication, there’s a good reason why. It is a fantastic device and Google Assistant is remarkably powerful. 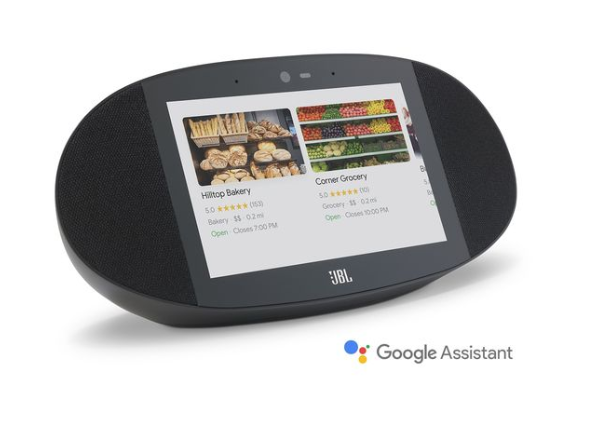 The JBL LINK VIEW reminds me a great deal of Amazon’s Echo Show. It has a large touchscreen, powerful audio and it integrates easily into your smart home. JBL’s offering, however, stands on its own for a number of reasons. 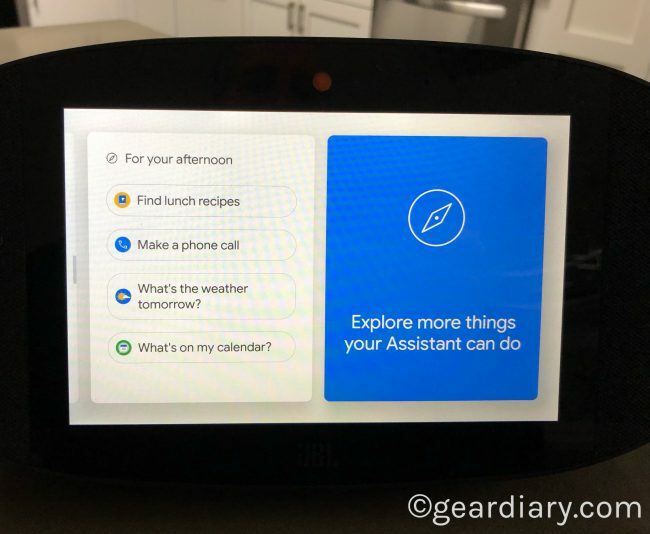 If you are in the market for a smart device with a large touchscreen and aren’t invested in any particular voice assistant ecosystem, this might be the best place to start. So let’s take a closer look. The device is fairly large measuring 13” by 6” by 4”. At the center of the device is an 8” screen that is flanked on either side by sizable speakers. Made of black plastic, the speaker “grills” are covered in black acoustic fabric. The oblong shape is reminiscent of a one half of a football (or watermelon if you prefer) if you cut it lengthwise down the middle. It is an unusual design that stands out without calling too much attention to itself. The high-definition screen delivers 720P resolution. I think it looks great, but I have seen some criticism of it online. The touchscreen is quite responsive to tough input. The speakers have 2” drivers that put out 10W of power each. At the back, there is a passive bass radiator. This smart display puts out serious bass! Below the touchscreen, there is a small JBL logo. 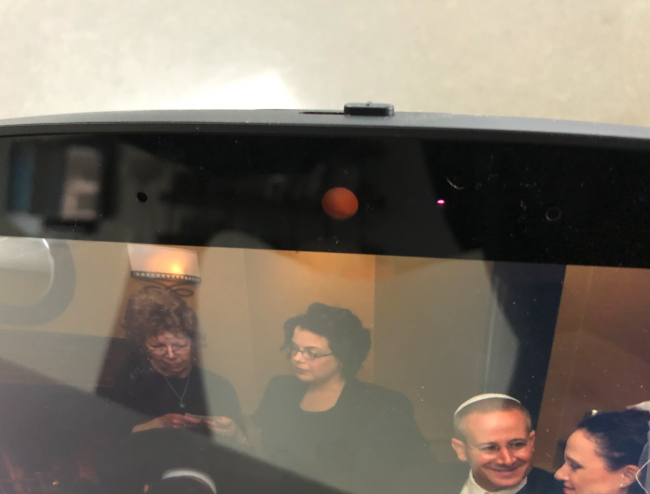 Above the screen, there is a 5MP camera for video chats. One nice touch is the inclusion of a slider that moves a privacy shield in front of the camera. It is a small design feature that reflects JBL’s commitment to really taking users into consideration when designing their products. I imagine I’ll leave the camera covered all the time unless I am actively on a video chat. After all, we already give up a tremendous amount of privacy by using Google products and inviting smart products into our homes. The last thing we need is to have a camera that can be hacked watching our every move. 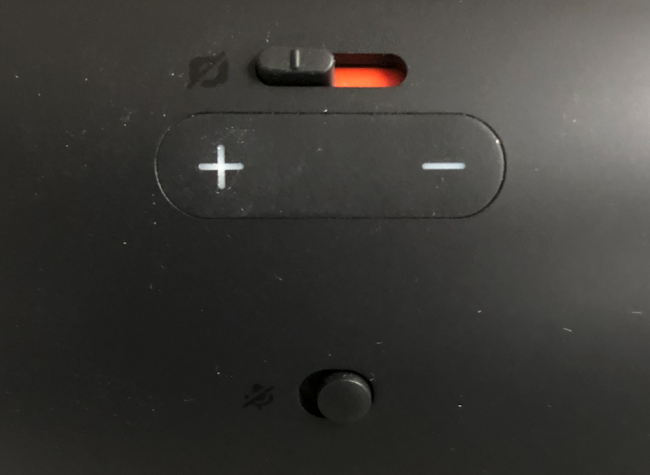 The only other physical buttons on the JBL LINK VIEW are the volume controls and a toggle to mute the microphone. (When you mute the microphone the device lets you know with “The mic is muted.” When you turn it back on you get, “The mic’s back on.” Both sit behind the screen on the curved portion of the product’s back. There are also proximity and light sensors built into the front bezel. The automatically set the brightness of the display, turn it off when the lights are off and wakes the device when you approach it. Sure, you can perform all of these actions manually, but what’s the point of a smart display if you don’t let its “smarts” do their thing? 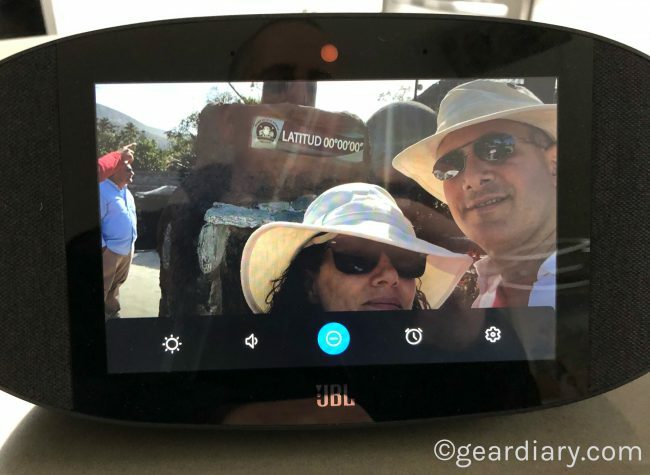 Unlike the Lenovo Smart Display, the JBL LINK VIEW can only be used in landscape mode. That’s no way to prop it up vertically. That’s not an issue unless you are using Google Duo for a video call. It uses a portrait orientation so you will get black bars on either side of the call screen. Once the product is unboxed and plugged in, you will want to make sure you have downloaded the Google Home app and logged in with your credentials. 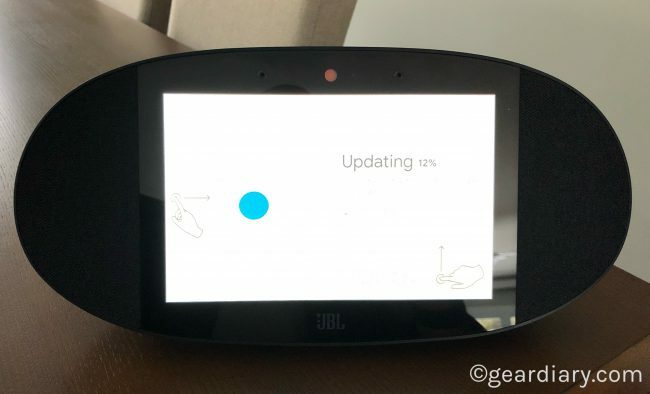 When you start up the device, you will see a JBL splash screen and then the colored dots that indicate Google Assistant is onboard. During the setup process, you will also have to select an Ambient mode to determine what is displayed on the main screen. For example, when I set it up the first screen I saw is some artwork with the time and temperature in the lower left corner. That’s because I had selected “Art Gallery” as the Ambient mode in the Google Home app. I didn’t want this to be the case so I went into the app and selected “Google Photos.” I selected Raina from the offered suggestions and, within seconds, the artwork was replaced by a series of images of my wife. In other words, the JBL LINK VIEW can also serve as an electronic photo album. That’s pretty cool although the fact that it was able to scan all of the photos I have uploaded to Google and select only those that include Raina is a bit scary. You can also select an Ambient mode that displays a more elaborate clock in full-screen mode. Oddly, while the Ambient mode shows the time and temperature it doesn’t show the date. Weird. During the setup process, you will also want to go into the “More” screen and set it up with your name, address etc. Settings are limited, but it is worth the time to make use of as many are relevant to you. From there, you will want to go to the short video tutorial to see some of the key tricks the JBL LINK VIEW has up its sleeves. It is definitely worth the time to get to know the device so you can take full advantage of what it offers. Tapping the screen reveals a screen with a good deal of useful information. There is the time and date, the current weather, a forecast for the next three days and a few upcoming appointments. Oddly, you can’t swipe the appointments “card” away. Tapping the day’s weather results in a screen with more weather details and a verbal readout of the weather. So, if I tap the Today icon the device reads out today’s weather. If I tap the icon for tomorrow I get tomorrow’s weather and if I tap the icon for two days from now I get that weather. Similarly, if I tap the calendar being displayed it reads out those appointments also. It is limited and requires a good many taps but it does work. Sliding from the left to the right returns me to the screen with the artwork while sliding right to left reveals a variety of other content that is accessible through the device. Sliding all the way over reveals an icon with the words “Explore more things your Assistant can do.” These include playing music, checking the weather, setting alarms, playing videos, finding recipes, managing photo, checking the news, setting tI ears, controlling my smart home, and much more. In fact, as I kept scrolling from right to left I could not believe the number of different ways Google Assistant can be helpful. 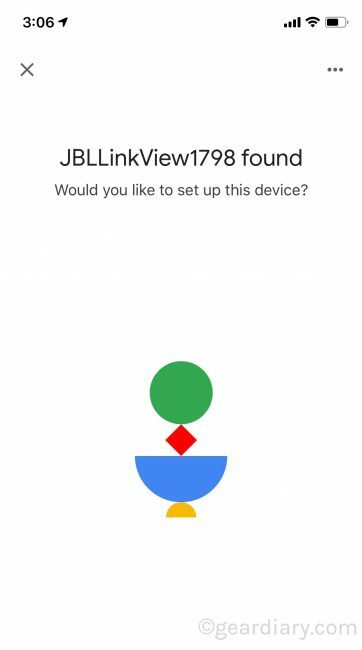 Speaking of the Google Home app, as noted, that’s where most of the controls of the JBL LINK VIEW can be found. At first, I found this a bit annoying, but I quickly realized that adjusting all the settings from my phone or tablet is far quicker and easier than were I to try to do it on the touchscreen of the device. 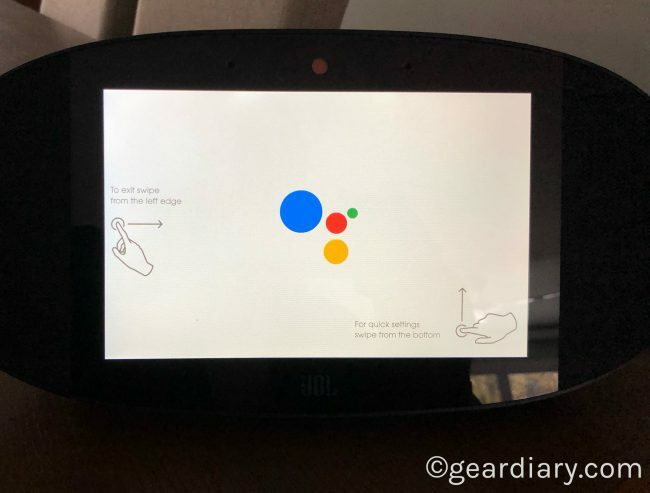 From the perspective of Google Assistant, this device functions in a manner identical to other devices such as those offered by Lenovo. But while the Lenovo offerings are impressively solid devices, from all reports the LINK VIEW delivers better sound. Regarding microphones, there is one to either side of the front-facing camera, and they do a good job of picking up your voice. In fact, I have not encountered a time when I had to repeat a request. That’s unlike my Amazon products which frequently require a second, or even a third, attempt. After you say the trigger phrase “Hey Google” here is an audible indication when Google Assistant is listening. You can turn this off in the Google Home app, but I’m not sure why you would want to do that. Because this is a Google Assistant device, you can also control your smart home. Any smart device that works with Google Assistant should be supported and you can use additional third-party services like Todoist or, if you like, Logitech’s impressive Harmony remote. I have my home operating via Amazon’s Alexa, so I didn’t attempt to fuss with the smart home controls lest I do something that added a glitch to a process that finally works the way I want it to work. The display is ideal for the kitchen since you can use it to pull up and display recipes. 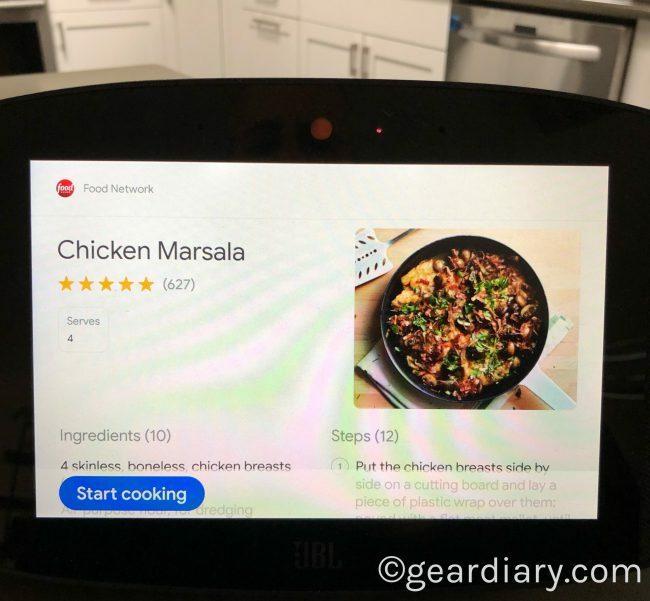 For example, I asked the device to display recipes for Chicken Marsala. It quickly offered a few options. I tapped the recipe from the Food Network, and it showed a picture and an icon that read “Start Cooking.” Tapping that, the display showed the ingredients. Oddly, to select any of these requires saying “Hey Google” each time. That’s the case when you move on to the actual recipe too. This approach is great since it means you won’t need to touch the screen in order to walk through the process of cooking but the “Hey Google” requirement is maddening. Then there is, of course, the audio. This is, first and for most, an audio device. That’s no surprise since it comes from JBL. In fact, even if this device didn’t have a screen it would be worth consideration. The sound is that good. 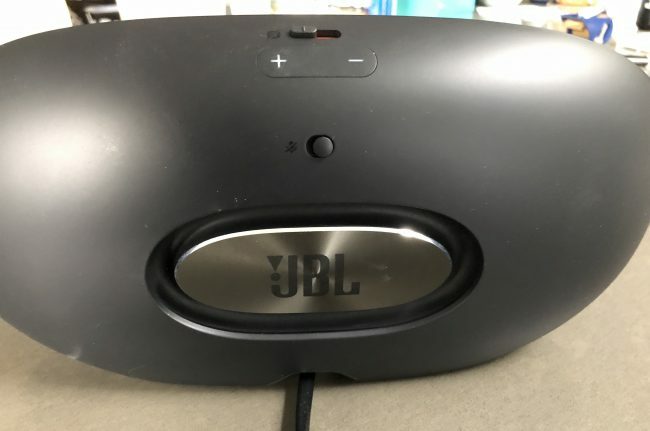 Sure, you won’t get the stereo separation you would were the speakers detachable, but for an all-in-one device the JBL LINK VIEW puts out an impressive sound that gets surprisingly loud without distortion. Sadly, the music services from which you can choose are limited. 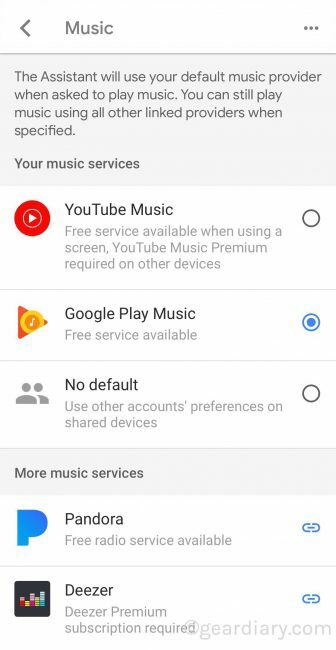 There’s Spotify, Google Play Music and a few more. If you use any of the ones that are supported, then you will be perfectly happy. If, however, you don’t, you will quickly see one of the huge limitations of this, and any Google Assistant, device. There is, of course, the option to pair this device with a phone or tablet via Bluetooth. Even there, however, it takes a few steps since the process requires the speaker to be told to go into pairing mode, and then the Google Home app is used for the actual pairing. That annoyance aside, however, the LINK VIEW does a great job as a Bluetooth speaker. It sounds awesome, gets quite loud, and it delivers surprisingly strong bass. As a Bluetooth audio device, the JBL LINK VIEW will impress. That’s reason enough to consider it. LINK VIEW does, however, have a screen. That makes it a device crying out for you to watch YouTube videos or other videos. (More on that in a moment.) The video is crisp and clear and the audio is perfectly synced. It is not, however, without its issues. For example, when I just asked, “Hey Google show me a live Morcheeba’s Summer Time” it quickly pulled up a few selections. I chose one, but before the video played I got a commercial for McDonald’s. Those moments of marketing annoyance reminded that this is a Google-powered device and Google is, after all, all about making money. Moreover, while the device has an 8” screen, you can’t play videos from Netflix, Hulu, HBO etc. After all, why would Google let sources it can’t make money from “use” their device when they have the highly profitable YouTube? 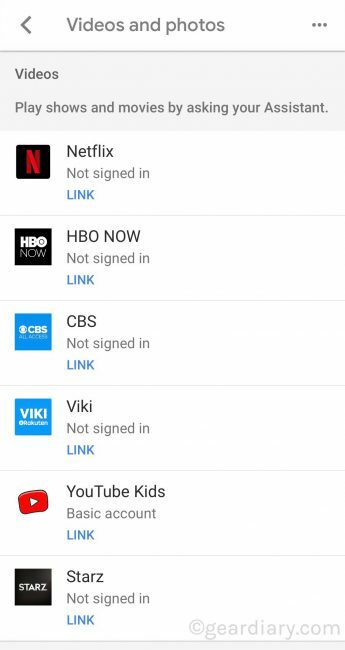 In fact, when you go to the “card” that displays, “Watch Live TV” the only options it gives you are for programs on YouTube TV. This is a huge limitation, but it is not of JBL’s making. All the blame falls squarely on Google and their self-imposed device limitations. Legendary sound. Now in a Smart Display with the Google Assistant: Get more than legendary sound. The integrated display included on JBL LINK VIEW allows you to get things done easily. It also has the Google Assistant built in, you can ask questions and tell it to do things. Just start with “Hey Google” to quickly enjoy your entertainment, stay connected with loved ones, view glanceable answers, manage daily tasks, and control your smart home. Your Assistant can help free up your hands and time, so you can focus on the things that matter most. Like watching videos of your favorite YouTube creators, reliving memories of your latest family vacation, making a video call to your best friend, receiving step-by-step baking instructions for delicious chocolate chip cookies, or dimming the lights for movie night. All this is delivered through a proprietary JBL transducer array, driven by a digital amplifier tuned to deliver full rich bass and crystal clear highs. This amazing combination of the Google Assistant, JBL Audio horsepower and HD display make JBL LINK VIEW a must have for your home or office. Google, Google Photos, Google Duo, YouTube and other related marks are trademarks of Google. In other words, even JBL knows that this is, first and foremost, a JBL speaker system. 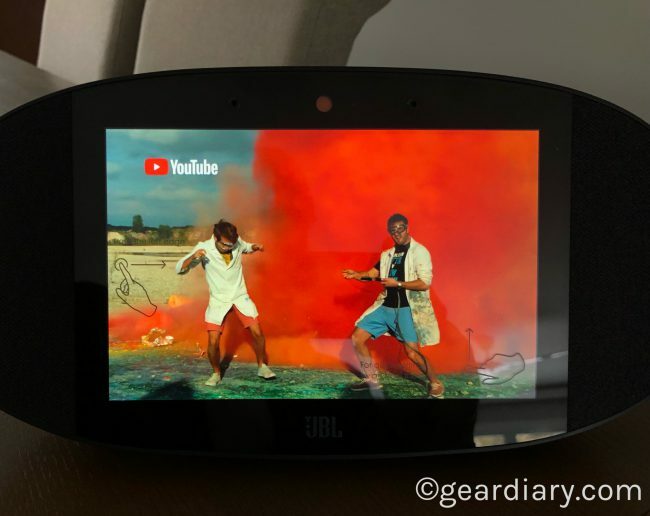 The screen and the implementation of Google Assistant take it to new heights but, at the end of the day, the reason to choose this smart display has everything to do with JBL’s years of experience creating high-quality home audio. Get help from your Google Assistant: Ask it question, tell it to do things, control your music, lights, queries and much more with a simple voice control. Legendary JBL sound: Enjoy incredible rich stereo sound with deep bass. 8” high-definition touch screen: View more information and content at a glance, clear and crisp. 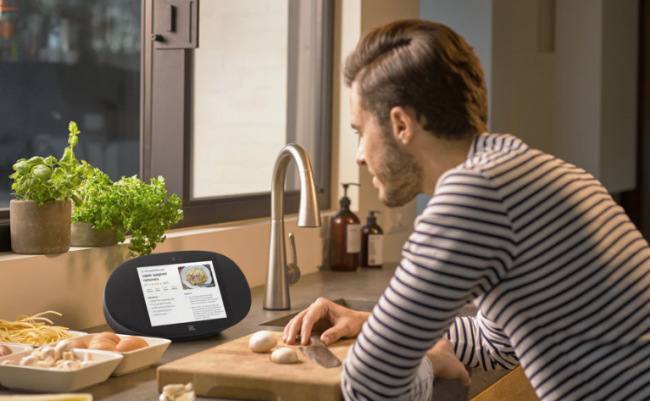 Splash proof and easy to clean: LINK VIEW is splash proof (IPX4) and easy to clean, it’s the ideal companion to enjoy music or to follow a tasty cooking recipe in the kitchen. Chromecast built-in: Let you instantly stream your favorite music, radio, or podcasts from your mobile device to your speakers. Wireless Bluetooth streaming: Wirelessly stream high-quality sound from your smartphone or tablet. 5MP front facing camera: Enjoy a high-definition video calls to your family and friends. PrivacySwitch: camera shutter and microphone mute switch ensures highest level of security and privacy, leaves hackers out of the house. If it hasn’t been clear, I like this device a lot. I’m a huge fan of JBL’s audio products and the JBL LINK VIEW delivers. 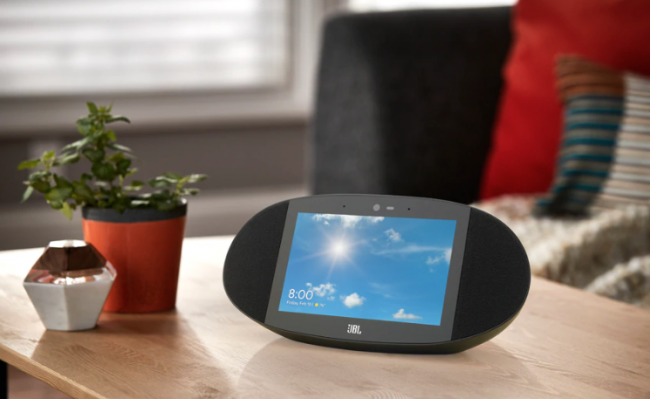 The 8” touch display is plenty large for a home device that isn’t a television or tablet and the inclusion of Google Assistant makes this a far smarter JBL speaker than any they have previously offered. That noted, while the Google Assistant implementation is nice, time and time again I find it frustrating, limited and frustratingly limited. 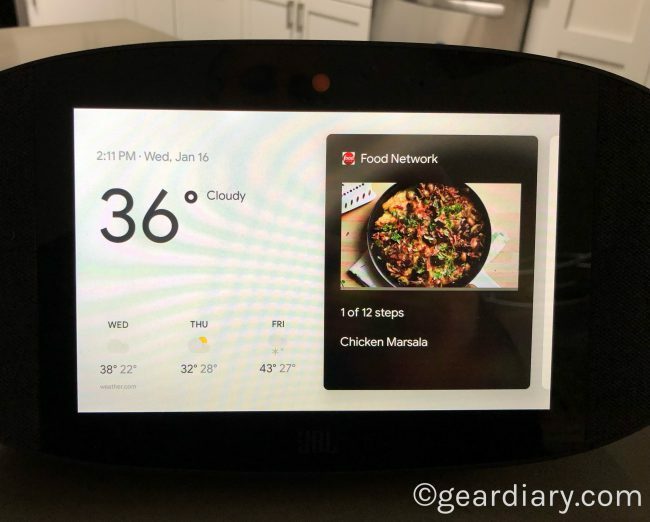 It is frustrating because there is only so much you can do from the touchscreen before needing to grab your phone and fire up the Google Home app. It is limiting because the video sources it will accept fall short due to limitations imposed by Google. And it is frustratingly limited because I often find myself forgetting the first two points and then wondering why this smart display isn’t smarter. That noted the audio is excellent and the smart device integration is decent for what it can currently do. 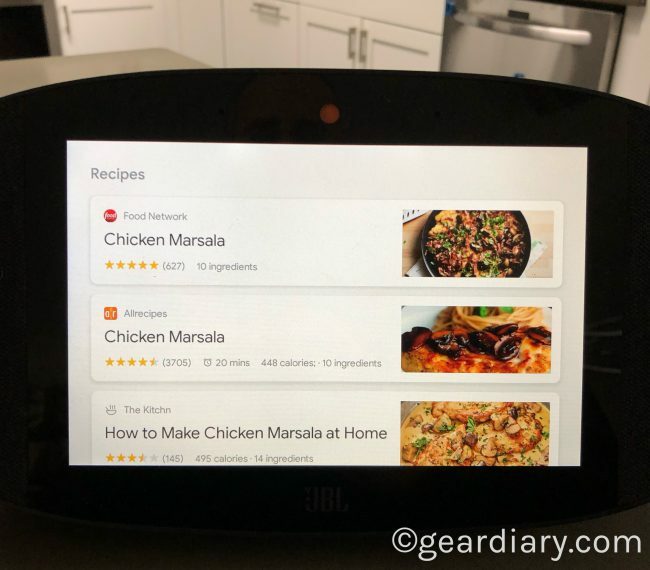 Over time, however, I hope Google will offer updates that can make this smart display a bit smarter than it currently is. I recommend it but do so with the caveat that you should know what it is that you are getting. This isn’t the holy grail of smart displays but this $249.95 smart display is pretty damn good! Check it out here.